ALLO BOX LOCATIONS: The solution to store your merchandise and stock, your flyers, important documents or your archives. Small to Medium Entreprises and self employed: No need to rent a warehouse or garage. 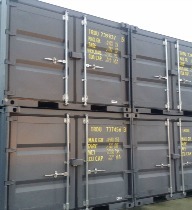 Your stock is at hand 7 days a week, on our secured storage Park, in dry maritime containers. FLEXIBILITY: Rent your Storage Box " a la carte", according to your needs and workload. Change the size of your storage Box according to your Company demands. No Hassle. Our Services; Reception of parcels and Stock with immediate confirmation, easy offloading bay, along with the tools to do it! Your security is assured by video surveillance 24/7. Rest reassured of the safety of your stock and esay access to your merchandise. ALLO BOX LOCATIONS: Simply your Business Partner.